In the last 3 years I have had a lot of travel back and forth to Toronto and Ottawa, and Kingston is the half-way point (it's about a 4 hour drive total, and Kingston is the 2 hour mark). Originally it was me living in Toronto visiting LJ in Ottawa, now it is mostly going back to the GTA to visit family. But LJ also often has business in the 'Limestone City'. That means brief stops for bathroom breaks, but also for grabbing some grub. 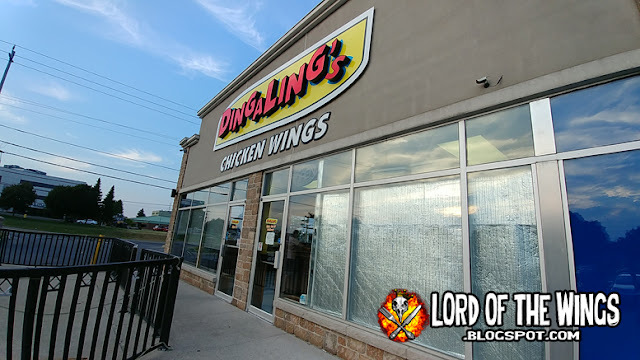 One spot I have stopped at frequently and have come to love is Dingaling's but because I started going here during my 'dark period' of the blog, I never did an official review. I did a mini-review for my 2016 Year in Review post, but after taking an evening with the wife to stop in, I decided to do the full review. Dingaling's is primarily a take-out wing joint that also does dine-in. The space is dark (although at the time of evening the setting sun was barreling in blinding us) and kind of sparse. It's too bad because they have space, but the place needs a renovation to make it more. Owner Shahid took over a few years ago from the previous owner (apparently a bad dude) and he cares about the business and about wings (I've chatted him up every time I've been in). 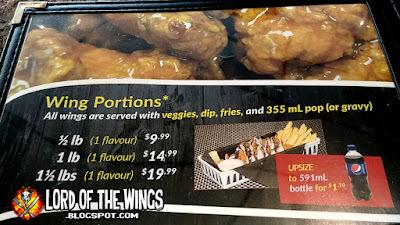 While I was going for wings (the main focus of the menu), LJ decided to go off script and try something else on the menu. The rest of the menu is appetizers and fried food (and at this point I think they have fried chicken too) as well as salads. We've had a few apps in the past, so she wanted to go with the Munchie Platter. The Munchie Platter is 16 pieces (4 different apps with 4 pieces each) and 3 dips. She went with Breaded Pickle Spears, Mozza Stixs, Stuffed Spuds, and Mac' N Cheese Bites with sour cream, blue cheese and ranch dips. Everything was fresh fried, crispy and tasty. 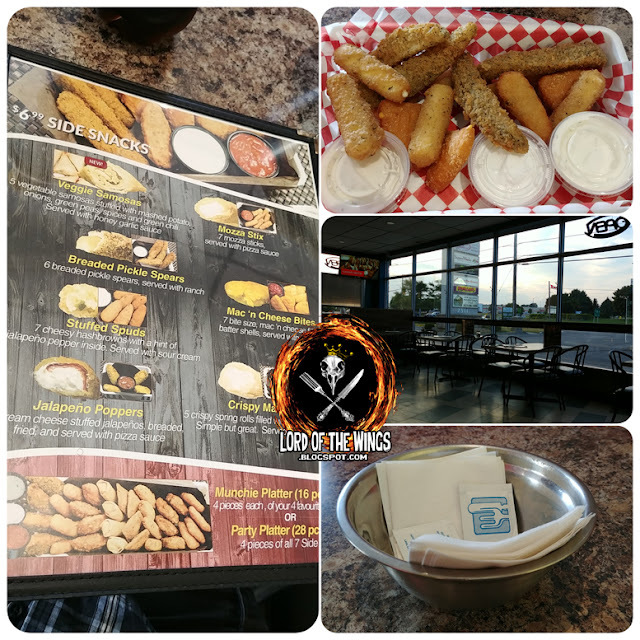 The pickles and mozza stixs were what you expect: dilly, cheesy, crispy. The Stuffed Spuds are mashed potato with some jalapeno (not that noticeable) - its a creamy inside with a crunchy exterior. 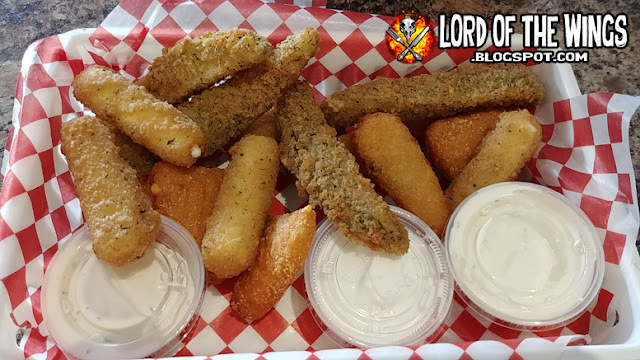 The Mac'N Cheese Bites are macaroni and cheese breaded and deep fried - to me they are ok but LJ and others like this kind of app. For my tastes, I just do steps 1 and 4. They come pretty saucy to begin and I'm not interested in mixing, so Step 2 is out, and I don't generally want extra on top, so so is Step 3. When dining in, the wings are served with fries and a pop - I switched my fries for waffle fries (I love waffle fries) and upgraded to a bottle (for LJ and I to share). It took about 10 minutes for our food to arrive. 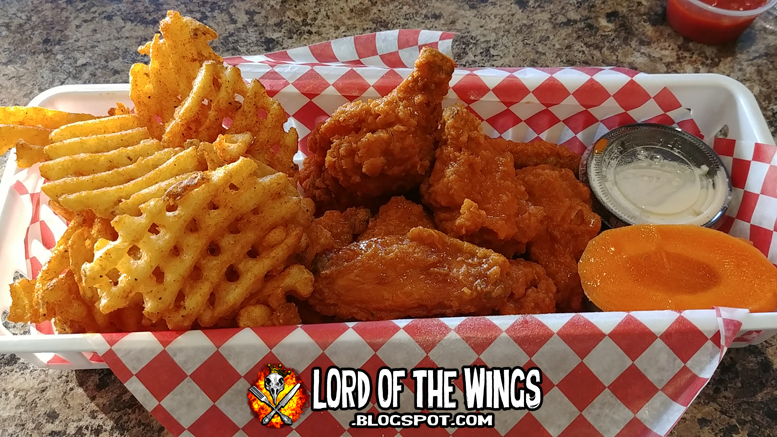 My sit-down wings came in a long little plastic tray pilled with waffle fries, the wings, and the veggies and dips. 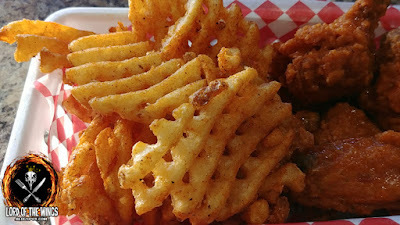 The waffle fries were very good - like everything else, crispy, but also pillowy potato in the middle. Great for dipping in the dips. The veggies that came with it were two small celery sticks and 2 large carrot coins. 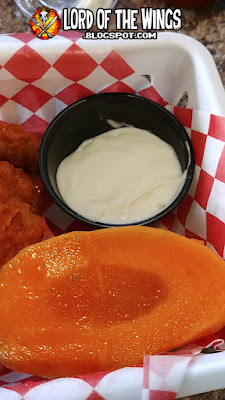 The blue cheese dip is thick and creamy. 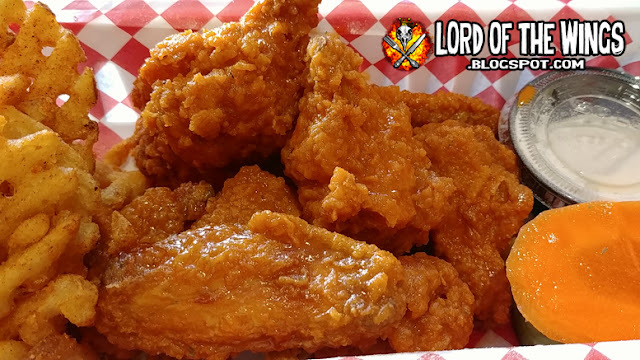 The wings come in orders of 1/2 pound, full pound, and 1 1/2 pounds. 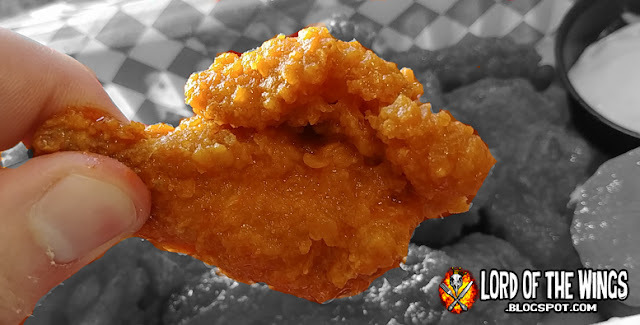 Above is the 1 pound which is about 9 wings. 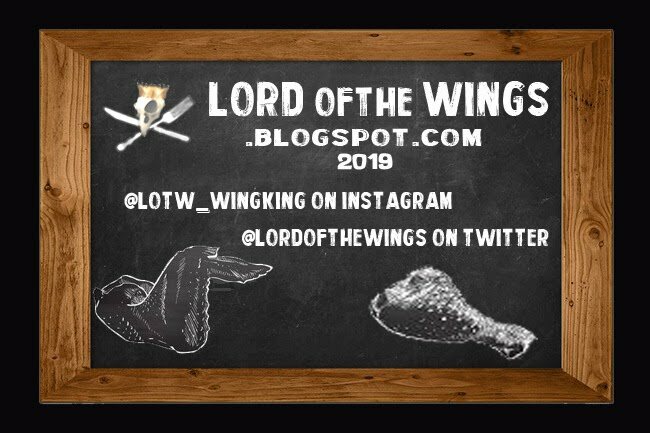 The chicken isn't very big length wise - I actually thought it had shrank since last time but when I reviewed my 2016 review, found them to be about the same. So while they aren't long, they are very meaty. 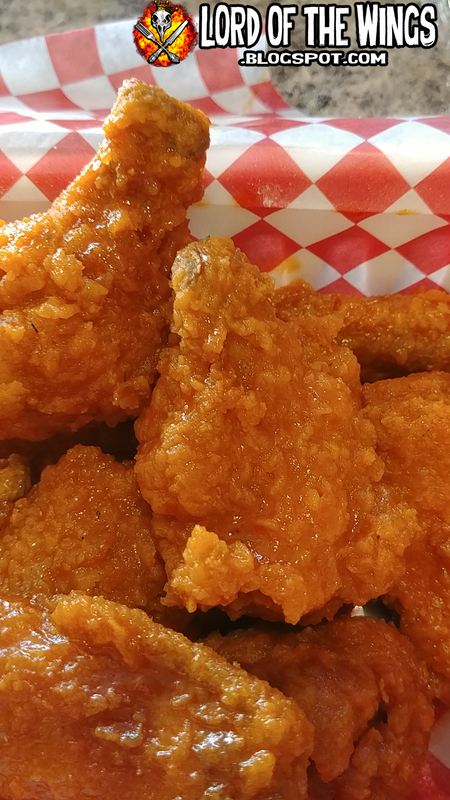 The wings are breaded, and deep fried. The wings are deep fried just right - the skin is crispy, crunchy and has those little bits that fall off and are tasty to eat. 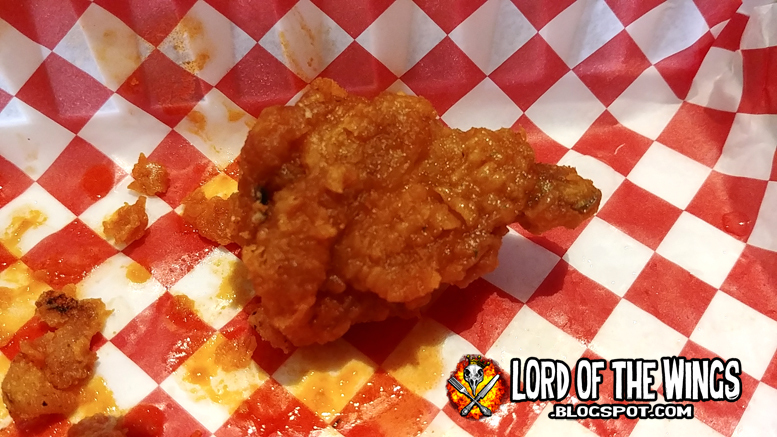 The wings are also very wet (not a lot of extra sauce but each wing is well coated) and the breading holds up pretty well, but after a while the wings become sauce saturated, but not so soggy that you lose that crispiness. I basically go for one sauce, Butter-Face. This is their hot sauce mixed with butter, essentially Buffalo wing sauce. This sauce is so rich and buttery, I could drink it. I love it. The combination of the decadent sauce and the crispy wings puts it on the top of my wing lists. 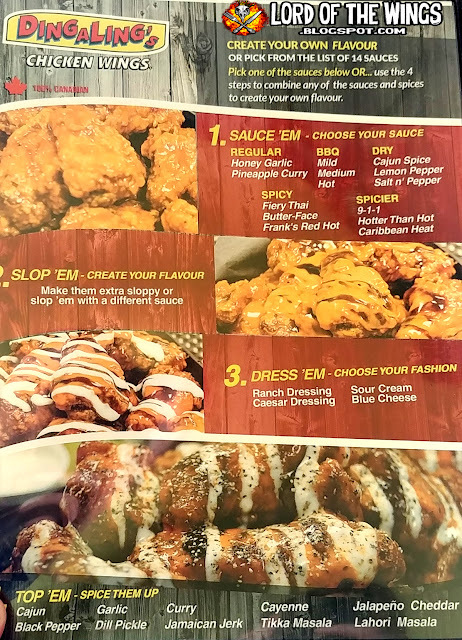 I've only ever tried one other sauce which was 9-1-1 and I had it and it was very hot (and also destroyed my digestion for a day) I didn't care for the flavour since I had Butter-Face. I always get the dill spice added, but to be honest, I never really taste it. Either they forget, or its not strong. Next time I'm going to ask for double sprinkling. These wings are really, really good. Crispy, crunchy, saucy, decadent. The butter heavy sauce mixed with the hot, the breaded crispy skin - so good! 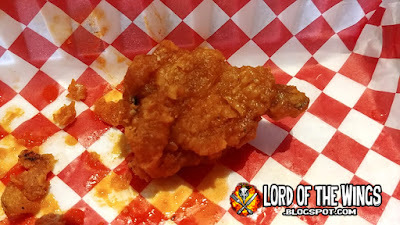 The meat is tender and it's a meaty wing, but I wish they were bigger. Sides are good and the apps are all deep fried goodness. I only wish they were in Ottawa! 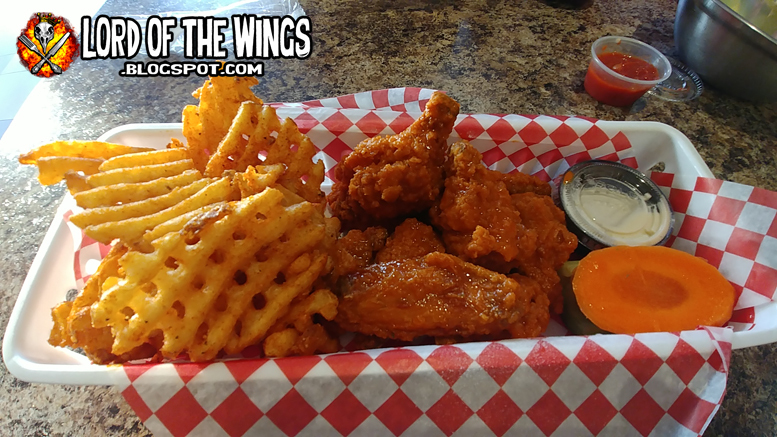 Happiness Happened Here - "Bone Stack"
TGIF - What Wings Do You Choose? Ketchup on wings? Ketchup spicy?! Happiness Happened Here: "Sauce Fan"